Week in, and week out, and days in-between, professing Christians meet at a local institutional church to further indoctrinate their families in the Protestant culture of death. It doesn’t seem like death as families cheerfully socialize together and lift up their hands as the hipster praise bands make a joyful noise to the Lord. In addition, charismatic orators speak of things that are clearly in the Bible. But let’s talk about good old fashioned theological math found in the Bible. The Bible addresses the only two people groups that exist in the world: the lost and the saved. As professing Christians, we want to be biblically defined as saved people, no? Can a case be made in this post that present-day evangelicals define themselves according to what the Bible defines as “lost.” Yes. All in all I am sure you will agree; any religion that defines itself as unregenerate is a really bad idea. Romans 6:14 – For sin will have no dominion over you, since you are not under law but under grace. We are under grace because the righteousness of Christ continually saves us from being under law. So, with Protestantism, it’s both. Under grace means we are still under law but progressively saved by grace. Under law is who we are, while we “experience” grace. Under law is what we do, under grace is what we experience. Supposedly, when Paul stated that we are “not” under law, what he really meant to say is under law is the absence of grace. The lost are only under law, but the saved are under both. Hence, we are still under the “righteous demands of the law,” but if we are under grace, Jesus keeps the law for us. This is achieved by focusing on our sinfulness against the law, and returning to the same gospel that originally saved us out of gratitude. Objections to this idea are met with accusations of indifference to Christ’s sacrifice. Therefore, the “Christian” must live a “lifestyle of repentance” and constantly seek a “greater revelation of self” which is inherently sinful. The goal is to plunge the depths of our supposed total depravity. And if you are paying attention, our sin and the original gospel that saved us are the constant drumbeats we hear in the institutional church week in and week out. At conversion, a person begins to see God and himself as never before. This greater revelation of God’s holiness and righteousness leads to a greater revelation of self, which, in return, results in a repentance or brokenness over sin. Nevertheless, the believer is not left in despair, for he is also afforded a greater revelation of the grace of God in the face of Christ, which leads to joy unspeakable. This cycle simply repeats itself throughout the Christian life. As the years pass, the Christian sees more of God and more of self, resulting in a greater and deeper brokenness. Yet, all the while, the Christian’s joy grows in equal measure because he is privy to greater and greater revelations of the love, grace, and mercy of God in the person and work of Christ. Not only this, but a greater interchange occurs in that the Christian learns to rest less and less in his own performance and more and more in the perfect work of Christ. Thus, his joy is not only increased, but it also becomes more consistent and stable. He has left off putting confidence in the flesh, which is idolatry, and is resting in the virtue and merits of Christ, which is true Christian piety (Paul Washer: The Gospel Call and True Conversion; Part 1, Chapter 1, heading – The Essential Characteristics Of Genuine Repentance, subheading – Continuing and Deepening Work of Repentance). Obviously, if we believe our formal sinful self has been “brought to nothing,” Paul Washer’s sanctification construct is impossible, and his statement speaks to the authentic soteriology of the Protestant Reformation. How do you achieve a greater revelation of your sinful self when your former sinful self has been “brought to nothing”? You don’t, which leaves the “believer” yet under law and in need of salvation. The “believer” needs to continually return to the same gospel that saved him/her in order to remain saved. Instead of the new birth being a onetime event that brings the former sinner to “nothing,” the new birth is defined as a joy experience resulting from revisiting the gospel afresh for forgiveness of sin that still condemns us. This cycle simply repeats itself throughout the Christian life. As the years pass, the Christian sees more of God and more of self, resulting in a greater and deeper brokenness. Yet, all the while, the Christian’s joy grows in equal measure because he is privy to greater and greater revelations of the love, grace, and mercy of God in the person and work of Christ (Ibid). We are asking the question, How does the gospel save believers?, not: How does the gospel get people to be believers?… Believers need to be saved. The gospel is the instrument of God’s power to save us. And we need to know how the gospel saves us believers so that we make proper use of it (John Piper: Part 2 of a series titled, “How Does the Gospel Save Believers”). Progressive sanctification has two parts: mortification and vivification, ‘both of which happen to us by participation in Christ,’ as Calvin notes….Subjectively experiencing this definitive reality signified and sealed to us in our baptism requires a daily dying and rising. That is what the Reformers meant by sanctification as a living out of our baptism….and this conversion yields lifelong mortification and vivification ‘again and again.’ Yet it is critical to remind ourselves that in this daily human act of turning, we are always turning not only from sin but toward Christ rather than toward our own experience or piety (Michael Horton: The Christian Faith; mortification and vivification, pp. 661-663 [Calvin Inst. 3.3.2-9]). …by new sins we continually separate ourselves, as far as we can, from the grace of God… Thus it is, that all the saints have need of the daily forgiveness of sins; for this alone keeps us in the family of God (John Calvin: Commentaries on the Catholic Epistles; The Calvin Translation Society 1855. Editor: John Owen, p. 165 ¶4). Moreover, the message of free reconciliation with God is not promulgated for one or two days, but is declared to be perpetual in the Church (2 Cor. 5:18, 19). Hence believers have not even to the end of life any other righteousness than that which is there described. Christ ever remains a Mediator to reconcile the Father to us, and there is a perpetual efficacy in his death—viz. ablution, satisfaction, expiation; in short, perfect obedience, by which all our iniquities are covered (The Calvin Institutes: 3.14.11). Where we land on these issues is perhaps the most significant factor in how we approach our own faith and practice and communicate it to the world. If not only the unregenerate but the regenerate are always dependent at every moment on the free grace of God disclosed in the gospel, then nothing can raise those who are spiritually dead or continually give life to Christ’s flock but the Spirit working through the gospel. When this happens (not just once, but every time we encounter the gospel afresh), the Spirit progressively transforms us into Christ’s image. Start with Christ (that is, the gospel) and you get sanctification in the bargain; begin with Christ and move on to something else, and you lose both (Michael Horton: Christless Christianity; p. 62). Nor by remission of sins does the Lord only once for all elect and admit us into the Church, but by the same means he preserves and defends us in it. For what would it avail us to receive a pardon of which we were afterwards to have no use? That the mercy of the Lord would be vain and delusive if only granted once, all the godly can bear witness; for there is none who is not conscious, during his whole life, of many infirmities which stand in need of divine mercy. And truly it is not without cause that the Lord promises this gift specially to his own household, nor in vain that he orders the same message of reconciliation to be daily delivered to them (The Calvin Institutes: 4.1.21). “As Pastors we must first preach the gospel to ourselves before we proclaim to the world the necessity of a Savior” Scott Thomas, President of Acts 29 Network. “Yet even when we understand that our acceptance with God is based on Christ’s work, we still naturally tend to drift back into a performance mindset. Consequently, we must continually return to the gospel. To use an expression of the late Jack Miller, we must “preach the gospel to ourselves every day” Jerry Bridges, Reformed author. Dr. Greg Brewton, Associate Dean for Music and Worship Leadership at The Southern Baptist Theological Seminary. “How can we not shift from the hope of the Gospel? By preaching the Gospel to ourselves daily… . “Preaching the Gospel to yourself” is a phrase I first ran across in The Discipline of Grace by Jerry Bridges, and have observed for years in the life of my good friend, C.J. Mahaney. C.J. has written persuasively, biblically, and practically on this topic in his new book, Living the Cross Centered Life… . Don’t take a day off from preaching the Gospel to yourself” Bob Kaulfin, Director of Worship Development for Sovereign Grace Ministries and worship leader at Covenant Life Church led by Josh Harris. “This may sound really selfish, but faithfully preaching the gospel to myself is actually what enables me to share it faithfully to others” Timmy Brister, SBC Associate Pastor. This isn’t a technique for boosting our spiritual growth; this is a means of re-salvation because we are still technically lost and under law. “Under grace” merely qualifies us for perpetual re-salvation. That’s Protestantism…period! Romans 6:15 – What then? Are we to sin because we are not under law but under grace? By no means! 16 Do you not know that if you present yourselves to anyone as obedient slaves,[c] you are slaves of the one whom you obey, either of sin, which leads to death, or of obedience, which leads to righteousness? 17 But thanks be to God, that you who were once slaves of sin have become obedient from the heart to the standard of teaching to which you were committed, 18 and, having been set free from sin, have become slaves of righteousness. 19 I am speaking in human terms, because of your natural limitations. For just as you once presented your members as slaves to impurity and to lawlessness leading to more lawlessness, so now present your members as slaves to righteousness leading to sanctification. Christ said, “You must be born again.” This is clearly a doctrine that redefines the new birth by defining the “believer” as unchanged and yet under law. Along with that is an unavoidable conclusion that this also includes a fruits unto death existence that is part and parcel with being under law. This will, and does make sin and condemnation the focus and theme of church while the Bible emphasizes ADDING virtue to our faith in contrast to a continual re-visitation of our supposed depravity. 1Peter 4:8 – Above all, keep loving one another earnestly, since love covers a multitude of sins. 2Peter 1:3 – His divine power has granted to us all things that pertain to life and godliness, through the knowledge of him who called us to his own glory and excellence, 4 by which he has granted to us his precious and very great promises, so that through them you may become partakers of the divine nature, having escaped from the corruption that is in the world because of sinful desire. 5 For this very reason, make every effort to supplement your faith with virtue, and virtue with knowledge, 6 and knowledge with self-control, and self-control with steadfastness, and steadfastness with godliness, 7 and godliness with brotherly affection, and brotherly affection with love. 8 For if these qualities are yours and are increasing, they keep you from being ineffective or unfruitful in the knowledge of our Lord Jesus Christ. 9 For whoever lacks these qualities is so nearsighted that he is blind, having forgotten that he was cleansed from his former sins. Romans 15:14 – I myself am satisfied about you, my brothers, that you yourselves are full of goodness, filled with all knowledge and able to instruct one another. Hebrews 10:24 – And let us consider how to stir up one another to love and good works. In the past, Protestants were confused enough about their own soteriological traditions that the fruits unto death were minimal, but during this Neo-Reformed resurgence that we are witnessing presently, such is not the case; the institutional church is a blatant culture of death. And those who would expose their children to it are woefully undiscerning. Ask yourself this simple question: do I leave church better equipped to see something that the Bible states isn’t there or better equipped to love God and others? Am I better at seeing my own depravity, or have I learned new ways to love which covers a multitude of sins anyway? To impart this blessing to us, the keys have been given to the Church (Mt. 16:19; 18:18). For when Christ gave the command to the apostles, and conferred the power of forgiving sins, he not merely intended that they should loose the sins of those who should be converted from impiety to the faith of Christ; but, moreover, that they should perpetually perform this office among believers” (The Calvin Institutes: 4.1.22). Secondly, This benefit is so peculiar to the Church, that we cannot enjoy it unless we continue in the communion of the Church. Thirdly, It is dispensed to us by the ministers and pastors of the Church, either in the preaching of the Gospel or the administration of the Sacraments, and herein is especially manifested the power of the keys, which the Lord has bestowed on the company of the faithful. Accordingly, let each of us consider it to be his duty to seek forgiveness of sins only where the Lord has placed it. Of the public reconciliation which relates to discipline, we shall speak at the proper place (Ibid). Come out from among them and be separate. Let me state something right out of the gate: the church has never been in a Dark Age. Christ said, “And I tell you that you are Peter, and on this rock I will build my church, and the gates of Hades will not overcome it” (Matthew 16:18). Imagine that. Peter wasn’t anybody—he was an everyday Joe—a blue-collar guy in that culture. Then one day God shows up personally and informs everybody that He would oikodomhsw “be building His church,” or some translators, “I shall be home building”….mou (of me)….the ekklesian (out-called, not “church” which is not a biblical word) on Peter. You can trust me on this one: Jesus has been home building His out-called, and the construction project has never slowed down or stopped. The building project has always been on schedule and within budget—funded by the Blood. And Christ didn’t choose a John MacArthur Jr. of that day—He chose an ordinary Joe. Right here, two pillars of the Reformation myth are found wanting. There has never been an out-called Dark Age, and Christ doesn’t primarily use renowned scholars like Martin Luther to get things done. Today’s “Reformed” “church” is built on the foundation of lofty creeds and confessions written by men of fleshly renown. The very name, “Reformed” is fundamentally false—our Lord’s building project has never needed a “reformation”—especially at the hands of murdering mystic despots. Thinkers who constantly wrestle with understanding. Sold-out to the sufficiency of the Scriptures as their only authority. Somewhere in the world since the day Christ showed up and walked into the everyday lives of twelve men, He has been slowly building His out-called. He has been building with those who possess the same spirit of Noah and is in-fact a fifth mark: they will stand alone if they have to. 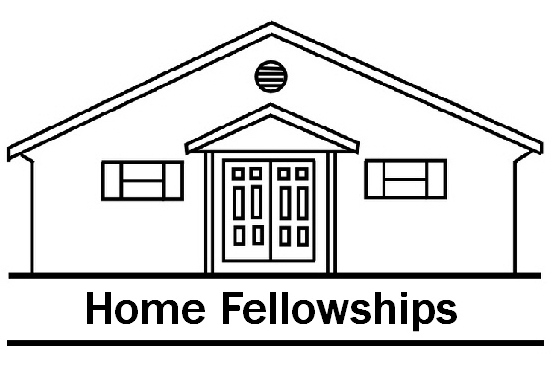 In the present day neo-Reformed blitzkrieg, it is, and will be two or three families who come out from among them, weeping with sorrow, often leaving the only church they have ever known while the door is held open for them by the young, petulant Reformers of our day that despise the sweat and blood that built the work that they have covertly sieged. As our brother Jude said of these brute beasts, they slip in “unawares” (v.4). Basically, the problem is the same as when Christ showed up to found His out-called. The religion of the day was founded on the authority and institutions of self-important men. People where amazed that Christ didn’t check in with the academics before He launched His ministry, nor quoted the spiritual brainiacs of that day. Likewise, if Christ came today, John MacArthur, Al Mohler, and the insufferable likes of obnoxious men like Steve Lawson and Paul Washer would watch with incredulities as Christ would ignore them and make a b-line for the ghettos—choosing His workers and confidants from among them. So how should I view an article sent to me by a reader that was written by John MacArthur regarding the Reformation motif of “Justification by faith.” First, as I am presently teaching my family, ALL ideas presented by men, and I believe that MacArthur fits into that category, will entail a litany of propositions that lead to a conclusion. Therefore, let us examine and wrestle with the propositions presented by MacArthur in this article (Justification by Faith: online source: http://goo.gl/xJyFO). The “Reformation doctrine”? Excuse me Mr. MacArthur (hereafter, JM), but we get our doctrine from the Bible, not the Reformers, who, as I have noted, are an oxymoron to begin with. In the first sentence of this article, JM sets up an authority between the out-called priests (that’s us) and the word of God. Therefore, his article is predicated on a proposition by men who are not original authors chosen by God— buyers beware. Hence, if we are discerning, JM has raised the propositional ante to a considerable level. By citing the preapproved authors of the Bible, additional consideration could have been avoided. Could the Reformers have been wrong? Even if they were right, is there a danger in making Reformed epistemology a standard of truth? Is the claim that the church stands or falls on this doctrine establishing Reformation doctrine as a significant authority? And if so, is this wise? Proposition 2: “Social and political concerns have brought evangelicals and Catholics together in recent years to unite against the forces of secularism. Under the influence of ecumenism, it’s difficult for either group to remember what it was that divided them in the first place. JM asserts that the Reformation was a marked contrast between Catholicism and the Reformers. Catholic influence is dragging the “church” back into a “Dark Age.” Regardless of the nomenclature of which he frames this proposition, he begins to articulate the Reformation motif in a way that is traditional, and packaged for fairly easy digestion—if you understand the premise of the motif, and we soon will. There was no difference in Reformation doctrine and Catholic doctrine. Subjective verses objective is key to understanding the Reformed denial of the new birth that predicates its false gospel. MacArthur begins to propagate the traditional Reformed dogma of subjective verses objective; that is, as I have previously stated, the crux of their doctrine. And is that biblical? Is Reformed doctrine biblical doctrine? Is the Reformed gospel the biblical gospel? We will take an interlude on the way to our understanding to examine the very significant contemporary contribution to understanding Reformation doctrine by its own proponents and advocates. It is true that Reformation doctrine has experienced times of low recognition followed by “rediscovery,” “resurgence,” and “revival” since the Sixteenth century. The last resurgence began in 1970. It was a rediscovery of authentic Reformed theology that launched the SDA Awakening Movement. Until then, the doctrine had never been framed in a subjective verses objective model of understanding. “Subjectivism” was fingered as the root of all evil verses the, and here it is: objective gospel outside of us. More specifically, “The Centrality of the Objective Gospel Outside of Us.” Hereafter, COGOUS. Because the Reformers saw justification and sanctification as the same thing, they argued that any enablement infused into the believer would automatically contribute to the justification process which they saw as progressive. Please note: this is exactly what JM et al accuse the Catholics of, but as we shall see, they are both guilty of this same thing: the fusion of justification and sanctification together. In it [Goldsworthy’s lecture at Southern] it gave one of the clearest statements of why the Reformation was needed and what the problem was in the way the Roman Catholic church had conceived of the gospel….I would add that this ‘upside down’ gospel has not gone away—neither from Catholicism nor from Protestants…. This meant the reversal of the relationship of sanctification to justification. Infused grace, beginning with baptismal regeneration, internalized the Gospel and made sanctification the basis of justification. This is an upside down Gospel…. When the ground of justification moves from Christ outside of us to the work of Christ inside of us, the gospel (and the human soul) is imperiled. It is an upside down gospel [emphasis Piper’s—not this author]. Note, if you think about it, it is impossible to “reverse” justification and sanctification unless they are on the same plane. Nor can you turn a two-part object upside down unless both parts are attached—making either one the “ground” or otherwise. Hence, a careful observation of Piper’s use of words betrays his subtleness in regard to believing in the fusion of justification and sanctification together. Furthermore, Piper’s beef with Catholicism is not the fusion of justification and sanctification together per se, but rather the infusion of grace into the believer. 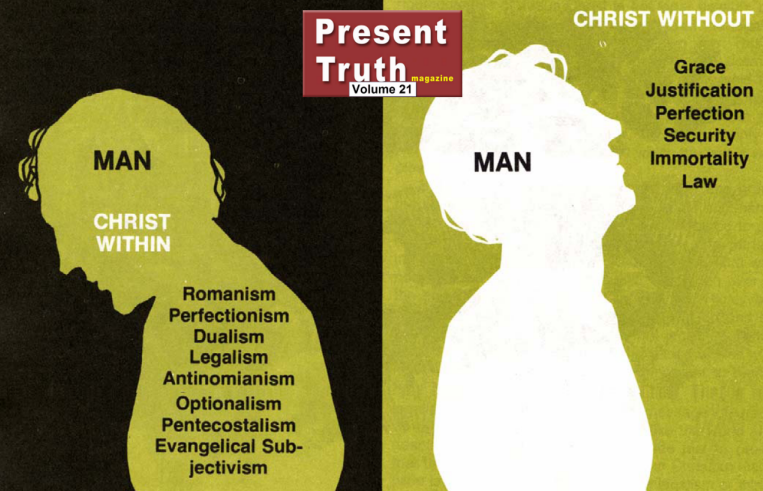 The AF two-man illustration depicts Piper’s contention to a “T.” Note the exact same issue: Christ within, or Christ without. Just grasp that for now, and put the absurdity of it on the back burner—it will come together for you later. Basically, if God’s grace/goodness is placed within the believer, he/she becomes enabled enough to become dangerous leading to all of the terrible things inside of the guy looking down. Everything must remain outside of the believer, leading to all of the good things listed on the right side of the chart which are listed outside of him. Don’t miss that. 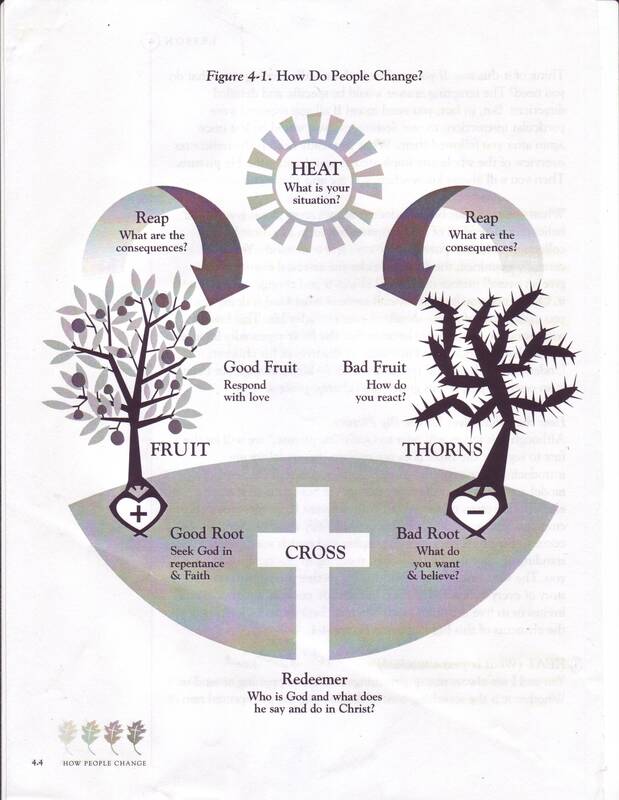 Today’s church owes Robert Brinsmead a tremendous debt of gratitude for publishing this chart. The sixteenth-century rediscovery of Paul’s objective message of justification by faith [and sanctification also because justification is supposedly progressive] came upon the religious scene of that time with a force and passion that totally altered the course of human history. It ignited the greatest reformation and revival known since Pentecost. In our time we are awash in a “Sea of Subjectivism,” as one magazine put it over twenty years ago. Let me explain. 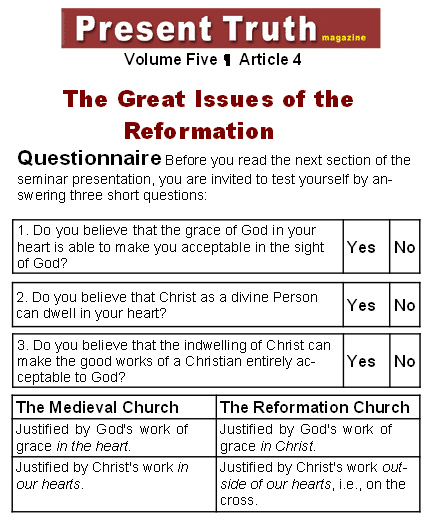 In 1972 a publication known as Present Truth published the results of a survey with a five-point questionnaire which dealt with the most basic issues between the medieval church and the Reformation. Polling showed 95 per cent of the “Jesus People” were decidedly medieval and anti-Reformation in their doctrinal thinking about the gospel. Among church-going Protestants they found ratings nearly as high…. I do not believe that the importance of the doctrine of justification by faith can be overstated. We are once again in desperate need of recovery. Darkness has descended upon the evangelical world in North America and beyond, much as it had upon the established sixteenth-century church. ….the doctrine of justification….has become shrouded in darkness once again. The Christian church today is in danger of returning to the Dark Ages. Enlightenment rationalism and postmodern subjectivism — rather than Scripture. The departure from sola scriptura has led to the departure from sola fide — justification by faith alone. JM, John Piper, Armstrong, Graeme Goldsworthy, and what they call the “Justification by faith” doctrine—all the same camp, and the same belief: The Centrality of the Objective Gospel Outside of Us. How in the World Does COGOUS Work in Real Life? As far as how this doctrine functions, there are two camps. But in both camps, the believer remains unchanged and totally depraved. The crux of COGOUS is that sanctification is a total work of God because it finishes justification. The doctrine then frames man’s role in regard to Gnostic ideas. In fact, the very first sentence of the Calvin Institutes is a Gnostic idea. Calvin claims therein that all knowledge is contained in the knowledge of ourselves and knowledge of God. Since we already know that Calvin believed in the total depravity of man, this is the knowledge of good and evil. 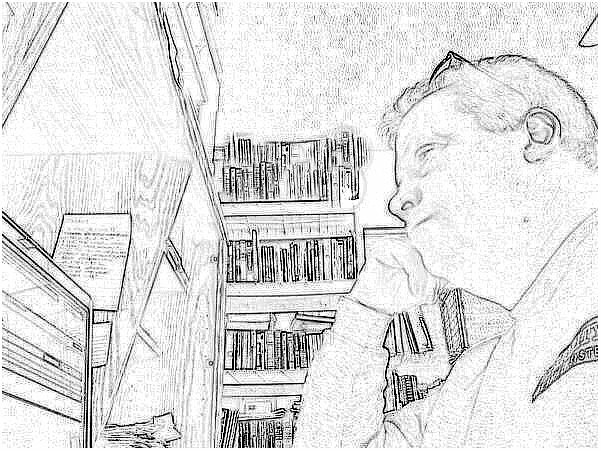 A rough sketch follows: all reality points to Christ’s glory, and all reality is wrapped up in the gospel and interpreted by it (the first tenet of New Covenant Theology). All history is “redemptive.” Therefore, all historical events, and events period, are preordained by God to show us wisdom; ie, the knowledge of the good (Christ), and the knowledge of the evil (our own depravity), and both point to God’s glory and “show forth the gospel.” So, all events in life are preordained by God to show us our own depravity, and His holiness. That’s the first way we gain wisdom of ourselves and God, and when we see it, our manifestation results in part of the grand gospel narrative preordained by God. The big picture model is the story of every believer. God invites us to enter into the plot! (Paul D. Tripp: How People Change, p.94). As believers gaze at the glory of their Lord—looking clearly, enduringly, and deeply into the majesty of His person and work—true sanctification takes place as the Holy Spirit takes that believer whose heart is fixed on Christ and elevates him from one level of glory to the next. This is the ever-increasing reality of progressive sanctification; it happens not because believers wish it or want it or work for it in their own energy, but because the glory of Christ captures their hearts and minds. We are transformed by that glory and we begin to reflect it more and more brightly the more clearly we see it. That’s why the true heart and soul of every pastor’s duty is pointing the flock to Christ, the Great Shepherd. In the 1500s a fastidious monk, who by his own testimony “hated God,” was studying Paul’s epistle to the Romans. He couldn’t get past the first half of Romans 1:17: “[In the gospel] is the righteousness of God revealed from faith to faith” (KJV). One simple, biblical truth changed that monk’s life — and ignited the Protestant Reformation. It was the realization that God’s righteousness could become the sinner’s righteousness — and that could happen through the means of faith alone. Martin Luther found the truth in the same verse he had stumbled over, Romans 1:17: “Therein is the righteousness of God revealed from faith to faith: as it is written, the just shall live by faith” (KJV, emphasis added). In its theological sense, justification is a forensic, or purely legal, term. It describes what God declares about the believer, not what He does to change the believer. In fact, justification effects no actual change whatsoever in the sinner’s nature or character. Justification is a divine judicial edict. It changes our status only, but it carries ramifications that guarantee other changes will follow. Forensic decrees like this are fairly common in everyday life…. Similarly, when a jury foreman reads the verdict, the defendant is no longer “the accused.” Legally and officially he instantly becomes either guilty or innocent — depending on the verdict. Nothing in his actual nature changes, but if he is found not guilty he will walk out of court a free person in the eyes of the law, fully justified. In biblical terms, justification is a divine verdict of “not guilty — fully righteous.” It is the reversal of God’s attitude toward the sinner. Whereas He formerly condemned, He now vindicates. Although the sinner once lived under God’s wrath, as a believer he or she is now under God’s blessing. Justification is more than simple pardon; pardon alone would still leave the sinner without merit before God. So when God justifies He imputes divine righteousness to the sinner (Romans 4:22-25). Christ’s own infinite merit thus becomes the ground on which the believer stands before God (Romans 5:19; 1 Corinthians 1:30; Philippians 3:9). So justification elevates the believer to a realm of full acceptance and divine privilege in Jesus Christ. The problem here is the implication that a pardon is not enough, and that our “standing” must be maintained lest we find ourselves “without merit”…. “before God.” This is problematic because any kind of standard that would maintain merit before God for justification is voided (Romans 7;1-4). There is simply no merit or standard left for a Christian to be judged by in regard to justification. Those two must be distinguished but can never be separated. God does not justify whom He does not sanctify, and He does not sanctify whom He does not justify. Both are essential elements of salvation. JM also clearly states that progressive sanctification is part of the same “salvation” process that justification is also a part of ; hence, they supposedly can’t be separated. But the Bible authors only speak of sanctification as salvation in a manner of speaking because there are three sanctifications: positional (1Cor. 6:11), progressive/practical (2 Cor. 7:11, 2 Peter ch. 1), and complete (1 Cor. 6:11[those who are sanctified positionally are glorified as well]), but only one justification that is a onetime legal declaration (Romans 8:30). Though justification and sanctification cannot be separated they must be distinguished. It would also stand to reason therefore that MacArthur, like all of the neo-Reformed, would not see any role for the believer in sanctification other than gospel contemplationism. This can be confirmed by reviewing the previous excerpt from Holland’s book. Roman Catholicism blends its doctrines of sanctification and justification. Catholic theology views justification as an infusion of grace that makes the sinner righteous. In Catholic theology, then, the ground of justification is something made good within the sinner — not the imputed righteousness of Christ. Please note JM’s either/or interpretive prism, (a neo-Reformed distinctive) that eliminates the possibility that the believer is empowered by the Spirit internally for something that is separate from justification; namely, kingdom living. Notice that the issue is specifically “something good” inside the believer verses the “imputed righteousness of Christ.” Obviously, JM rejects the idea that it can be both, and whatever it is, it must point back to justification if it is something “good” inside of the believer. Rome’s motive for fusing the two together is beside the point, both the Reformers and Rome believe the two cannot be separated. Hence, for Rome it was easy: Christ forgives all of your past sins, but now you must do certain things to complete your justification because salvation is linear with both justification and sanctification on the same plane. Likewise, the Reformers believe in the same linear gospel, but pardon it by making everything that needs to be done to complete justification—totally of Christ alone. This requires us to remain totally depraved in the process and utilizes Gnosticism for whatever application can be surmised. Frankly, this is the first time that I have seen writings from JM that totally remove all doubt that he has bought into this doctrine , hook, line, and sinker. If sanctification is included in justification, the justification is a process, not an event. That makes justification progressive, not complete. Our standing before God is then based on subjective experience, not secured by an objective declaration. Justification can therefore be experienced and then lost. Assurance of salvation in this life becomes practically impossible because security can’t be guaranteed. The ground of justification ultimately is the sinner’s own continuing present virtue, not Christ’s perfect righteousness and His atoning work. The contradictions here are mindboggling. 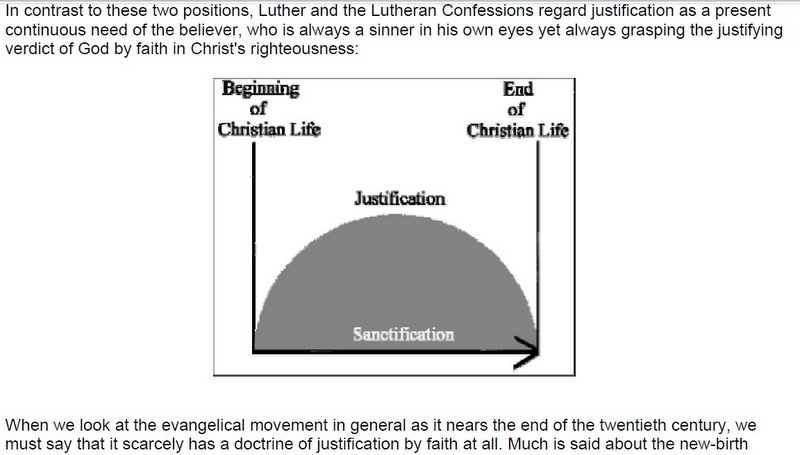 Again, “If sanctification is included in justification….” Is somehow different from, “… . but can never be separated.” Like all in this camp, JM complains about those who combine the two, while at the same time stating that they cannot be separated. If sanctification is included in justification, then justification is a process, not an event. That makes justification progressive, not complete. But MacArthur is a Calvinist, and progressive justification is exactly what John Calvin propagated. Again, they accuse Rome of exactly what they are guilty of themselves. In fact, Calvin entitled chapter 14 of the the third book of the Calvin Institutes, “The Beginning of Justification. 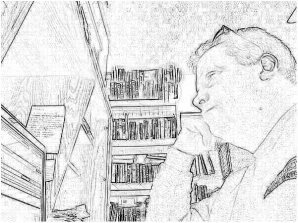 In What Sense Progressive.” Calvin then makes the same case throughout the rest of the chapter that all New Calvinists constantly make–that a believer must continually return to justification for their sanctification. Seeing these kinds of blatant neo-Reformed contradictions in his teaching is truly sad to watch. What is it going to take to overcome this kind of error in the church? Christians who think, and love truth enough to wrestle with it long and hard. That’s going to be a small percentage of Christians as thinking is also not in vogue. Nevertheless, they are out there—Christ said they would be in increasing numbers as He continues to build His out-called ones. But MacArthur is a Calvinist, and progressive justification is exactly what John Calvin propagated. Again, they accuse Rome of exactly what they are guilty of themselves. Calvin entitled chapter 14 of the third book of the Calvin Institutes, “The Beginning of Justification. In What Sense Progressive.” Calvin then makes the same case throughout the rest of the chapter that all New Calvinists constantly make–that a believer must continually return to justification for their sanctification. Seeing these kinds of blatant neo-Reformed contradictions in MacArthur’s teaching is truly sad to watch when one considers what he once was. Going to church violates a plethora of biblical commandments, but this post will focus on a particular three: Philippians 4:8, 1 Corinthians 13:6, and Hebrews 10:24, 25. Granted, the point being made by this post was arguable twenty years ago when Protestants were confused for the better, but since the Neo-Protestant resurgence is in full swing and has taken over the vast majority of evangelical churches in our day the point is now valid. The displayed image with this post illustrates the crux of authentic Protestant sanctification. Notice that the focus is our sin, and the idea that we are a bottomless resource of unexposed sin. 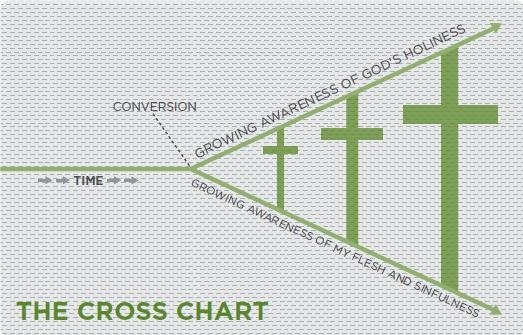 The downward trajectory is the focus in order to glorify God (the upward trajectory) and “make much of the gospel” (the bigger cross). Problem is, the apostle Paul instructed us to “dwell” on what is honorable and good, not evil; ie., sin. See Philippians 4:8. Furthermore, and this addition is for free, Romans 6:6 states that in the saved person the body of sin has been brought to nothing. If that’s true, how is an application of the bottom downward trajectory even possible? “Progressive sanctification has two parts: mortification and vivification, ‘both of which happen to us by participation in Christ,’ as Calvin notes….Subjectively experiencing this definitive reality signified and sealed to us in our baptism requires a daily dying and rising. That is what the Reformers meant by sanctification as a living out of our baptism….and this conversion yields lifelong mortification and vivification ‘again and again.’ Yet it is critical to remind ourselves that in this daily human act of turning, we are always turning not only from sin but toward Christ rather than toward our own experience or piety” (Michael Horton: The Christian Faith; mortification and vivification, pp. 661-663 [Calvin Inst. 3.3.2-9]). “God gathers his people together in a covenantal event to judge and to justify, to kill and to make alive. The emphasis is on God’s work for us – the Father’s gracious plan, the Son’s saving life, death, and resurrection, and the Spirit’s work of bringing life to the valley of dry bones through the proclamation of Christ. The preaching focuses on God’s work in the history of redemption from Genesis through Revelation, and sinners are swept into this unfolding drama” (Christless Christianity p. 189). So, Sunday “worship” is a “dying and raising.” We die to self via sin-sniffing resulting in the exaltation of vivification facilitated by gospel praise and worship music. We go in lowly and humble resulting in a resurrection of rejoicing. What scripture does this violate? 1 Corinthians 13:6 which informs us that love does not rejoice in evil. In contrast, the Protestant doctrine of mortification and vivification results in a joyful resurrection from dwelling on sin. And lastly, going to church for this reason, is in contrast to the biblical purpose for gathering together as stated by Hebrews 10:24, 25—to encourage each other unto good works. What is the alternative? Get a Bible and assemble together weekly with like-minded believers for that very purpose, not dwelling on things that have been brought to nothing through Christ’s death on the cross. 2 Peter 1:1-14 contradicts almost all of the major tenets of authentic Protestantism: Christocentric salvation; Christocentric interpretation; double imputation; Christocentric sanctification; the total depravity of the saints; sanctification by faith alone; the imperative command is grounded in the indicative event; assurance based on gospel contemplationism; sanctification is not “in our OWN efforts”; the apostolic gospel. “Simeon Peter, a servant and apostle of Jesus Christ, to those who have obtained a faith of equal standing with ours by the righteousness of our God and Savior Jesus Christ” (v1). Salvation is not Christocentric. Peter states that we obtained our faith by God the Father AND Jesus Christ. “May grace and peace be multiplied to you in the knowledge of God and of Jesus our Lord” (v2). The benefits of salvation are multiplied by the knowledge of both the Father and the Son. Of course, this knowledge can only come from the Scriptures. Obviously, knowledge of both is required for the multiplication of grace and peace. One may also note that when Peter restates this truth in verse 3, he only mentions the one “who called us” which of course is God the Father. “The imputed righteousness of Christ” is an often heard slogan among reformed. But it is the righteousness of God that was imputed to us by the New Birth when we believed in Christ (see v1). The believer is righteous because he is God’s literal offspring. Christ lived a perfect life as a man because of who He is (the Son of God), not for the purpose of imputing obedience to us as part of the atonement in sanctification. “His divine power has granted to us all things that pertain to life and godliness, through the knowledge of him who called us to his own glory and excellence” (v3). Again, God the Father is the member of the Trinity who called us. Knowledge pertaining to the Father is efficacious in sanctification. “His divine power has granted to us all things that pertain to life and godliness, through the knowledge of him who called us to his own glory and excellence, 4 by which he has granted to us his precious and very great promises, so that through them you may become partakers of the divine nature, having escaped from the corruption that is in the world because of sinful desire” (v3,4). “Partakers” is: koinōnos from koinos; a sharer, that is, associate: – companion, fellowship, partaker, partner. Koinos means: common, that is, (literally) shared by all or several and is derived from a primary preposition denoting union; with or together, that is, by association, companionship, process, resemblance, possession, instrumentality, addition, etc. : – beside, with. In compounds it has similar applications, including completeness. “For this very reason, make every effort to add to your faith goodness; and to goodness, knowledge; 6 and to knowledge, self-control; and to self-control, perseverance; and to perseverance, godliness; 7 and to godliness, brotherly kindness; and to brotherly kindness, love” (v 5,6,7). Obviously, if sanctification is by faith alone, Peter wouldn’t tell us to ADD anything to it. “For if you possess these qualities in increasing measure, they will keep you from being ineffective and unproductive in your knowledge of our Lord Jesus Christ. 9 But if anyone does not have them, he is nearsighted and blind, and has forgotten that he has been cleansed from his past sins. 10 Therefore, my brothers, be all the more eager to make your calling and election sure. For if you do these things, you will never fall, 11 and you will receive a rich welcome into the eternal kingdom of our Lord and Savior Jesus Christ” (v8,9,10,11). Glorification (and one could argue assurance as well) is an indicative act, but in these verses, it is contingent and preceded by imperatives. Peter uses the conjunction “if” three times to conjoin imperatives preceding the indicative. One of the more hideous teachings of the Reformation is that guilt is indicative of not understanding grace. Therefore, saints will not be told to take biblically prescribed action to relieve guilt, but will be told to further contemplate the gospel. There is barely anything more powerful in the Christian life than full assurance of salvation, and Peter tells us in no uncertain terms how to obtain it: aggressively adding certain things to our faith. Authentic Protestantism, by default, disavows our effort in sanctification by continually utilizing the either/or hermeneutic: it’s either all our effort, or all of Christ. Though we can do nothing without Christ, Peter makes it clear that peace and assurance will not take place if we do not “make every effort” (ESV). “So I will always remind you of these things, even though you know them and are firmly established in the truth you now have. 13 I think it is right to refresh your memory as long as I live in the tent of this body, 14 because I know that I will soon put it aside, as our Lord Jesus Christ has made clear to me. 15 And I will make every effort to see that after my departure you will always be able to remember these things” (v12,13,14,15). Think about it. It had been revealed to Peter that his departure was near, so his ministry was focused on what he thought was the most important thing that they needed to be continually reminded of. Where is, “The same gospel that saves us sanctifies us”? Where is, “We must preach the gospel to ourselves every day”? Where is, “Beholding the face of Christ as a way of becoming”?